When I first starting blogging in March of 2008, I truly enjoyed sharing the some great finds I've come across while feeding my shopping addiction. Since I began to be immersed in product reviews, I have not been sharing about my everyday shopping experiences. 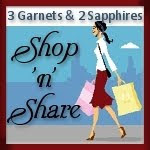 I do miss it, so I decided to officially bring these posts back in this new series called "Shop 'n' Share". I look forward to sharing great deals I find and any interesting things that I purchase without writing out a formal product or website review. These will be quick posts where I can share my finds along with a photo or two.